What is the checked statement in C#? What is the benefit of using checked statement in C#? How to use checked statement in C# programming? The checked statements force C# to raise exception whenever underflow or stack overflow exception occurs due to integral type arithmetic or conversion issues. This program raises exception while executing because it is using checked statement that prevent the current execution when stack overflow exception appears. 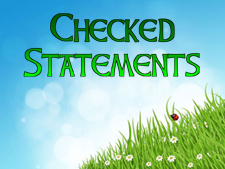 In this chapter you learned what checked statement is and also learned how to use checked statement in C sharp programming. In next chapter you will learn about Unchecked Statement in C#.